Years ago I designed a room for a Philadelphia area Decorator ShowHouse. I chose to do a small Butler’s Pantry. I didn’t have a lot of money to spend on the room so I did everything myself, except for the counter tile and hiring an artist to paint trompe l’oeil plates on the backsplash. Everything in the room was for sale except the window treatment. After I made it I just couldn’t part with it. I had many requests to buy it, but I am so glad I kept it. I love the colors and the texture of the cloth. I made it from scraps of vintage bark cloth that I found stuffed in a corner at a local consignment shop. At the time of purchase I had no idea what I was going to do with it. I thought I could use it for a few small scale projects. When I needed a window treatment for the Show House pantry I knew this fabric would look perfect, but I didn’t have a big enough piece. Since I had my mind made up that only this fabric would do, I decided to sew all the scraps together to make one long piece. I used a Vogue window treatment pattern that had some pleats in it that I figured would hide the seams of the sewn together scraps. I added brush fringe to the bottom and lined it with a black and white vintage check that I found in the bargain bin at Calico Corners. The pattern directions called for sewing pleats across the top of the valance, then mounting on a board. Since my sewing skills go no further than sewing a straight line, I opted to gather the fabric where the pleats would have went by hand and wrapped each tightly with wire.I then tied the ends of the wire onto vintage wrought iron swing rods that I found at a flea market. To hide the wire I simply wrapped decorative cord around each pleat. I also spray painted the rods gold and white-washed them with craft paint, leaving on just enough white to accent the decorative parts of the rod. *You can see how I updated and explained this project in a full tutorial here. This pantry was one of two rooms chosen from this Show House to be published in Traditional Home’s Decorator ShowHouse Magazine that year. (top photo) When the Show House was over I hung the valance in my bathroom at home – where it still hangs. After making this valance and seeing how popular it was, it made me realize that my projects don’t have to always be perfect. Imperfection adds character and makes a statement all its own. I bought the magazine this appeared in and hung on to it for years. 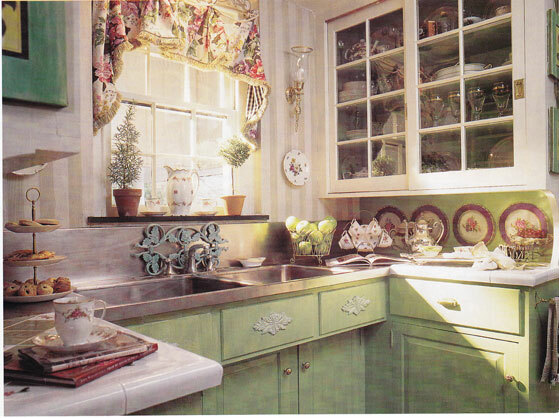 I can’t remember if it was Romantic Homes, BHG decorating or Country Living but I hung on to it for years. 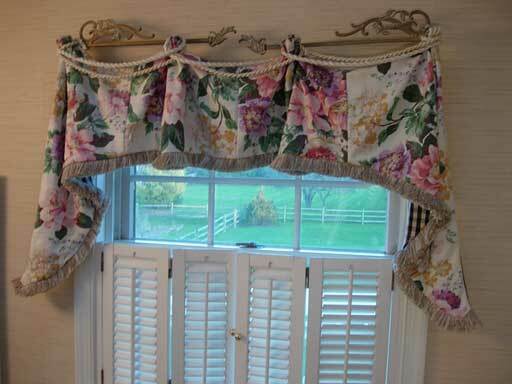 I loved that valance too! Your work is beautiful. Can’t believe I just found your website and that’s your valance. Thanks for inspring and sharing your beautiful talents. So glad I found you (again!) So many great ideas. I’m now a follower. I think the texture in bark cloth is what makes it so appealing. There are not many fabrics with that weave. I am not really a vintage decorator, but I love this fabric and the colors in it. Even if I tire of the valance, I will probably take it apart to make something else with it. I love this! I love barkcloth and have some that we got from my hubby’s grandmothers things. I just love it. I can understand why you wouldn’t want to part with it! You have done a lovely job. I love the whole look! Beautiful post. I come across those swing rods from time to time at antique stores and have wondered how to use them. Thanks for the inspiration!